We had the opportunity to receive a subscription box from Prospurly Subscription Boxes. I know there are so many of you out there that prefer organic or want to try it without breaking the bank or making a huge commitment. Have you heard of the Prospurly Subscription Box? Every month subscribers receive 6 to 8 Artisan products that value $80. Every box is filled with organic, artisan products valued at $80. Every item is hand selected. Each box follows an exciting theme like waffle breakfast or summer picnic. Around the 25th of each month you will receive enchanting hand crafted bath and body products, delectable gourmet food, gifts and games and more! Again every product in the box is hand selected. In the Prospurly box I received, there were 7 great items. 1. Body Resurfacer from The Savvy Heart - peppermint, 2. Organic Loose Leaf Peppermint Patty Tea, 3. Bonsia Tree Kit, 4. Sensitive Plant seeds, 5. St. Fiacre's Farm - Winter hand crafted hand Balm 6. One Handcrafted soap (orange) and 7. German Gluhwein Mulling Spices for wine and cider. Prospurly was born from the idea that pursuing a healthy happy life should be fun and easy for everyone. Each box is carefully crafted to encourage a positive and healthy living. Prospurly has a serious commitment to quality. Prosperly was inspired by "Epicurus", a Greek philosopher born in 341 BC. Epicurus believed that we think we know what we need to be happy, having lots of money and to buy lots of stuff. Material things can't really keep us happy and in fact can be distracting, we should focus on living an analyzed life that provides a freedom with ample time to spend with our loved ones. Prospurly was inspired by Epicurus's ideas. Though none of his works have survived today his followers have passed his ideas along forever. 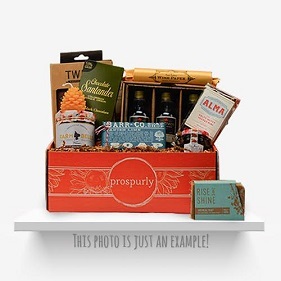 Prospurly has instilled his ideas into their boxes with good food, great gifts to share with good friends and inspiring tools to grow positive! You can connect with Prospurly via Prospurly Facebook , @prospurly , Prospurly Pinterest , Prospurly Instagram and Prospurly Website .